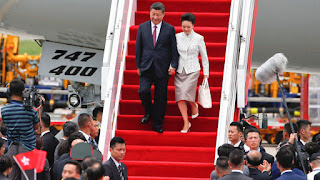 Chinese President Xi Jinping has arrived in Hong Kong to mark 20 years since the handover of British rule to China. Speaking to a crowd waiting to greet him, he said: "After nine years I am once again stepping on Hong Kong soil. I feel very happy. Hong Kong has always had a place in my heart. "We are willing, together with different sectors of Hong Kong society, to look back on Hong Kong's unusual course in the past 20 years, draw conclusions from the experience, look into the future and to ensure 'one country, two systems' is stable and has a far-reaching future." However, the President's visit was not welcomed by all, with several arrests made ahead of his arrival and thousands more protesters expected to turn out to celebrations which take place on Saturday. Hong Kong was returned to China under a 'one country, two systems' agreement, which guarantees greater autonomy when it comes to judicial independence and civil liberties. Activists in Hong Kong say there is too much interference from Beijing. Martin Jacques, author of When China Rules the World and visiting professor at Tsinghua University in Beijing, told Sky News: "Xi's visit is to say 'Hong Kong is now part of China'... there are arguments about certain intrusions. "Hong Kong is still very different from China; rule of law rests on English law, the media is free and there is a right to protest." 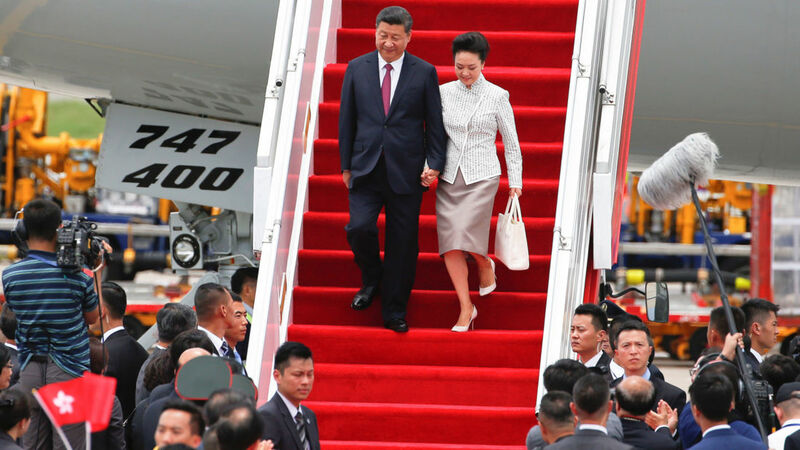 Mr Xi's visit will coincide with the swearing in of Hong Kong's first female chief executive, Carrie Lam, who has promised to heal divisions in the region. Mrs Lam has caused concern among activists for saying children should be instilled with Chinese identity and suggesting there could be tough punishments for those who advocate for independence. The streets of Hong Kong have been adorned with Chinese banners and celebratory messages to coincide with Saturday's festivities. The organiser of a rally planned to coincide with the celebrations said in a statement: "Hong Kong has been lied to for 20 years - let's retake Hong Kong for a real and fully fledged democracy."